The internet is evil. Nothing but bad can come of it. You meet people who you are unlikely to come across in the real world. Strange virtual folk with strange virtual habits. Unknown, scary, likely to have hidden agendas and devilment on their minds. But I have found these demons to be kind and generous. They speak my language. They enhance my life. It doesn’t matter where they come from, what colour they are, their religion, inside leg measurement or favourite member of Take That. They are trusting and trustful. The few that aren’t exist in the real world too and are probably just as malevolent. 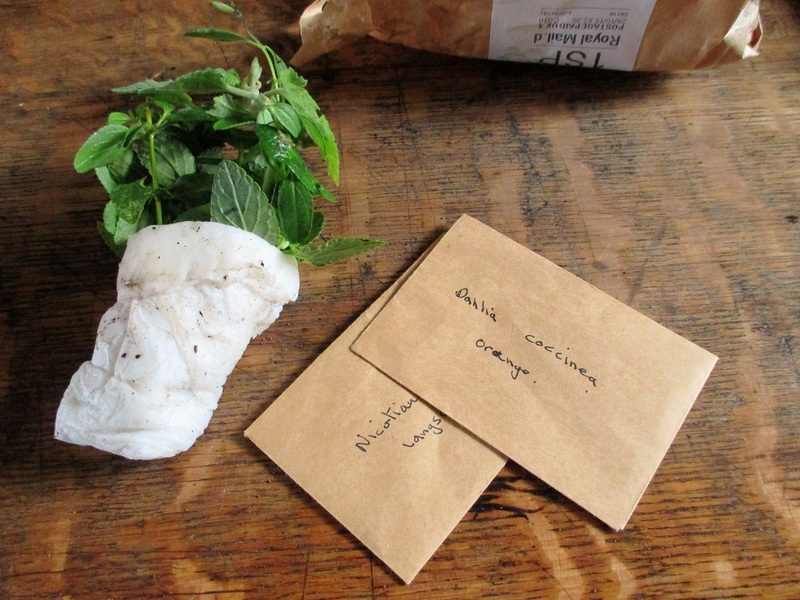 Thank you to my blogging pal Chloris from http://www.thebloominggarden.wordpress.com for a most welcome parcel of seed and cuttings that arrived today. Beware the evil internet. You have been warned. Bad internet! Good postal service! My internet friends are all good. I’ve traded seeds and plants with several blogging friends. It is pretty special to see something growing in your garden that was a gift. 🙂 The internet is like the real world – moderation is the key. Exactly, it is lovely to have a garden full of memories. I will be careful …. I’ m glad they arrived safely. I have to say that in 2 years blogging I haven’ t come across any demons or trolls. Everyone has been kind and just lovely. Eccentric sometimes, but lovely with it. I think it’ s because they are gardeners. Gardeners are nice people. Probably different if you strayed into the world of stamp collecting, train spotting, bowls or politics.. Then you’ d probably come across evil trolls. Perhaps you are right, we are in good company. I had not done any social media until I met Gill. Now I am a convert to this wonderful gardening blog and have discovered a couple more. Catching up on the thoughts & deeds of lovely like-minded people and in the comfort of my home at a convenient time. What a treasure trove the web can be. Love, love love seeds swopping with like minded souls, love, love, love the Internet….met a few trolls along the way, but hey ho, that,s life anyway. Your blog always cheers me up in the mornings.